InTune is a proprietary blend of essential oils carefully selected for their ability to enhance and sustain a sense of focus. No matter your age, staying focused on the task at hand is sometimes difficult. This is especially critical during the formative years when learning and growing create habits and a foundation for life. The carefully selected essential oils in doTERRA InTune Focus Blend work together, supporting efforts of those who have difficulty paying attention and staying on task. Sandalwood, Frankincense, and Lime promote a sense of clarity, while the benefits of Patchouli, Ylang Ylang, and Roman Chamomile are calming and soothing. 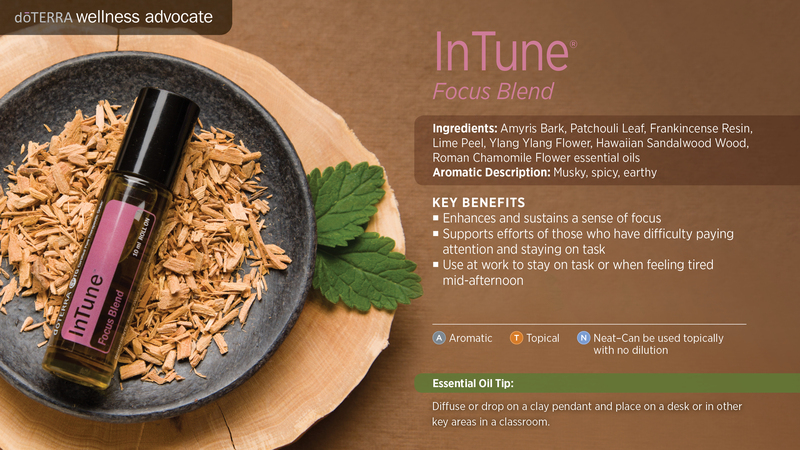 The pleasing aroma of InTune Focus Blend makes this essential oil blend an easy and delightful one to use. Dispense InTune on a clay pendant and place on a desk or in other key areas in a classroom. Possible skin sensitivity. Keep out of reach of children. If pregnant or under a doctor’s care, consult your physician. Keep out of eyes, inner ears, and sensitive areas. Dilute with doTERRA Fractionated Coconut Oil to minimize any skin sensitivity. Avoid sunlight or UV rays for up to 12 hours after applying product.